Ian McLauchlan, known throughout the rugby world as Mighty Mouse, is the current president of the Scottish Rugby Union. 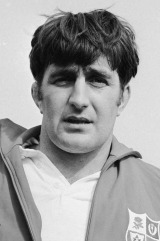 McLauchlan, a phenomenal scrummager and animated in the loose, was at the heart of the British and Irish Lions test series successes in New Zealand (1971) and South Africa (1974). Ayrshire-born, he captained Scotland on 19 occasions. He won his first cap out of the Jordanhill club against England in 1969 and his 43rd and final cap against New Zealand ten years later.